The 2014 State of the State's Health Report released by the Oklahoma State Board of Health shows Oklahoma ranks 44th in overall health status of its residents compared to other states in the nation. Unhealthy lifestyles and behaviors such as low physical activity and fruit and vegetable consumption, along with a high prevalence of smoking and obesity, contribute to most of the state's leading causes of death. Significant health disparities among many of the state's population also contribute to Oklahoma's health status. The annual study reports on a range of factors and details information by county. 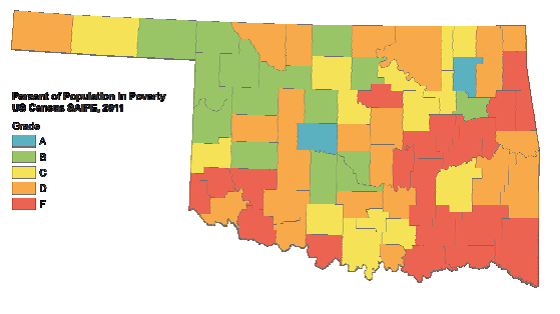 One of the contributing factors to the poor health of Oklahomans is the poverty rate. 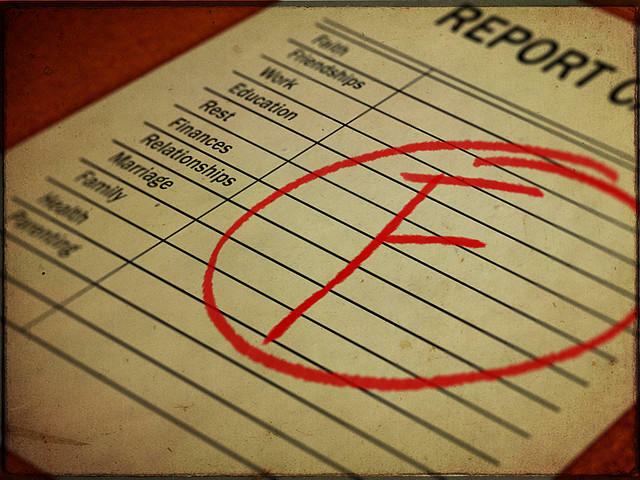 The report indicates that in 2012, one in six Oklahomans lived in poverty, yet that is a small improvement. While the rate of poverty across the nation increased 20 percent since 2008, but during that time Oklahoma rose from a rank of 41st in 2008 to 35th in 2012. Still, the report notes that Oklahoma’s poverty rate has exceeded the national rate since 1990. The report notes that in 2012 the poverty threshold for a family of 4 was an annual household income of $23,283 or less and for a single adult it was $11,720. A person working at minimum wage 40 hours per week, 52 weeks a year only earns $15,080. In contrast, the state’s uninsured adult rate improved to 18 percent in 2012 from 22 percent in 2011, and Oklahoma now ranks 29th among the states. Texas has the worst rate at nearly 31 percent uninsured. The best improvement was among Oklahoma’s Native Americans whose rate of uninsured dropped from 20 percent in 2011 to 9% in 2012. One barrier to medical insurance is income: adults earning under $25,000 per year were the least insured. Another barrier is age: as people age they gain insurance and those 65 and older have the best rate because of Medicare. Education also plays a role: those with high school degrees or less have rates from 20-35 percent uninsured. Oklahoma has the 12th highest rate of death due to cancer in the nation. Oklahoma has the third highest rate of death due to heart disease in the nation. Oklahoma has the fourth highest rate of death due to stroke in the nation. Oklahoma has the highest rate of death due to chronic lower respiratory disease in the nation. Oklahoma has the fourth highest rate of death due to diabetes in the nation. Oklahoma had a nearly 50 percent increase in death due to unintentional injuries from 2000 to 2012. Oklahoma has the next to lowest rate of fruit consumption in the nation. Oklahoma has the 44th lowest rate of vegetable consumption in the nation. Oklahoma is the 44th least physically active state in the nation. Oklahoma has the sixth highest rate of obesity in the nation. Oklahoma’s adult smoking rate in 2012, while better than the 26.1 percent in 2011, was 23.3 percent compared to 19.6 percent nationally. State Board of Health President, R. Murali Krishna, M.D., says, "While some key health indicators are improving, such as infant mortality and smoking rates, we still have many challenges that will require us to redouble our efforts and engage our partners in focused interventions to help Oklahoma achieve a state of health." The report highlights some of the positive outcomes resulting from an investment in evidence-based practices and approaches utilized by community coalitions, statewide organizations and Oklahomans who are actively seeking health improvements for themselves and their fellow Oklahomans. Programs like "Every Week Counts," which focuses on reducing pre-term deliveries, and community events such as "A Healthy Baby Begins with You," which promotes prenatal care, are making a difference. A partnership with the Oklahoma Tobacco Settlement Endowment Trust on tobacco use prevention and nutrition and fitness community initiatives, the Million Hearts campaign to reduce cardiovascular disease deaths through improved blood pressure control, and the Certified Healthy Oklahoma program, which helps businesses, schools, communities, campuses and restaurants provide environments that are conducive to health, all show promise in helping improve Oklahoma's health status. Americans are being released from hospitals quicker and sicker. That’s put new demands on the family members who care for them. PBS Newshour special correspondent Kathleen McCleery reports from Oklahoma. A new public-private initiative is working to reduce heart attacks and stroke in a five-county area in southeastern Oklahoma. The Oklahoma Heartland Project combines public health personnel with physicians, nurses, pharmacists, hospitals and insurers to help patients reduce their risk for heart disease and stroke and live a longer, healthier life. Counties participating in the initiative include Pittsburg, Pontotoc, Coal, Atoka and Latimer. The pilot project is funded through a grant from the Association of State and Territorial Health Officials.